If you want to add some rounded borders to an element, and also to have a gradient on that element, you’ll notice in IE9 that your rounded borders have some background with corners below them. Notice background visible behind rounded borders. Notice that FILTER at the bottom. This is used for ie7 and 8, but it also adds some background for ie9. We need to get rid of it for ie9, and everything will be ok then. It may be another class, or asterisk as well. This entry was posted in CSS CheatSheets and tagged css gradients gradients rounded borders. Bookmark the permalink. Just use a wrapper div (rounded & overflow hidden) to clip the radius for IE9. Simple, works cross-browser. SVG or JS, conditional comments are unnecessary. Works like a charm. IE9 users don’t need to see the gradient anyway. Just make sure your CSS gradient style name matches the style specified in the HTML script. Thanks much! Works wonderfully. 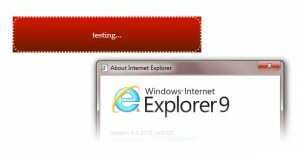 We have to support IE9+ with all other browersers. The gradient worked for all. Good job!